We've been having an old-fashioned blueberry festival in this family over the past two weeks. We've had Blueberry Buttermilk Pancakes at least three times (including twice for dinner), two versions of blueberry cobbler, waffles topped with blueberry compote, and I've even made blueberry lime jam. Blueberries are fresh and plentiful around here in June and July and and I'm taking full advantage of the local crop. I eat them plain, I bake with them and I use them to top my steel cut oats. I believe that when fruits are vegetables are in season you should eat them to your heart's content, so I'm sharing this recipe with hopes that you'll have your own little blueberry festival. Up until about two years ago I always made my pancakes from a boxed mix. I don't know why, but I felt it was easier and I didn't think I'd be able to taste the difference between scratch made and boxed mixes. I was wrong... very wrong. A while ago I discovered this recipe for buttermilk pancakes from Short Stop. Although the recipe yields way more pancakes than I need for two people (we usually cut it in half and we still have leftovers), it's become my go-to pancake recipe. They are as light and fluffy as promised. It also only takes me about five minutes to measure out the ingredients and it only dirties up one more bowl than making pancakes from a boxed mix. These pancakes are one of the reasons why I always have buttermilk in my fridge. 1. Preheat the oven to 200 degrees F.
2. Find a large, oven-safe platter or plate and tear off a piece of foil large enough to cover the plate. Put the plate in the oven to preheat. 3. If you have one, use a large, flat griddle that covers two eyes on your stove to cook your pancakes. If you don't have a large griddle, use two nonstick pans. 4. As the pancakes are cooked, put them onto the warm platter, cover with foil and keep them in the oven until serving time. A 200-degree oven is warm enough to keep your pancakes hot, but not hot enough to burn your hands when you reach in for the platter. As long as you serve your pancakes within a half hour you shouldn't have any issues... plus, everyone can eat breakfast together. As far as cooking pancakes... it takes some practice. Make sure you don't have the heat up too high for thick batters like this one. Always spray your hot griddle with cooking spray to prevent sticking. 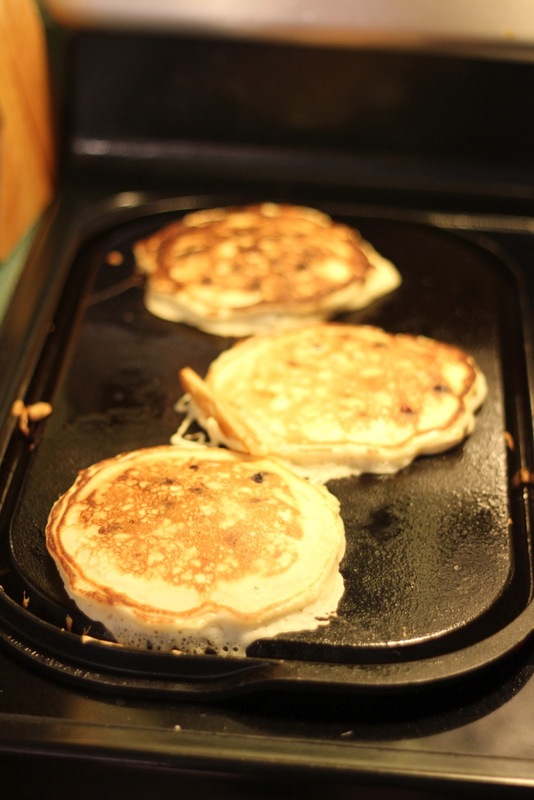 Look for air bubbles as an indication of when to flip your pancakes. Make sure your spatula gets a good grip on the pancake before you attempt a flip. I like to cook all of the pancakes at once (it takes me about 25 minutes) and keep them warm in the oven until they go to the table. These pancakes are absolutely worth the trouble. They are perfectly fluffy and moist and unbelievable when served with hot syrup and real butter. These pancakes are better than any I've had in a restaurant. Here's the full recipe, modified slightly from Short Stop. This recipe will serve 6 adults, so if you have a smaller household you should cut the recipe in half. In a large bowl, combine flour, sugar, baking powder, baking soda, and salt. Toss blueberries in the dry mixture. Set aside. In a separate bowl, beat together buttermilk, milk, vanilla, eggs and melted butter. Keep the two mixtures separate until you are ready to cook. Pour the wet mixture into the dry mixture, using a wooden spoon or fork to blend. Stir until just blended together. Do not overmix. Scoop the batter onto the griddle, using approximately 1/3 cup for each pancake. Cook on both sides until golden brown. Serve with real butter and warm syrup and powdered sugar, if desired. I agree, once I went pancakes from scratch, there was no going back. I even shocked my great aunt from Geogia when I told her I make mine from scratch. Now of course I want a huge stack of pancakes for lunch. what's a girl to do? !